Hello and welcome to our live coverage of stage 2 of the Vuelta a San Juan. Today's heat-shortened stage runs around 130km from Chimas to Peri Lago Punta Negra. Today's breakaway is already up the road on this shortened stage 2. The UCI's extreme weather protocol was invoked today due to the high temperatures, meaning that around 30km has been lopped off today's distance. Hamish Schreurs (Israel Cycling Academy), Andre Gohr (Brazil), Edison Bravo (Chile), and Miguel Alvarez (Mexico) are up the road. The four riders are working well together and look to have a decent gap on the peloton. It looks like these men are going to be the break of the day. Here's the story on the shortening of today's stage. Yesterday's stage 1 saw temperatures soar to around 40°C, and the riders are racing through similar heat today. Yesterday, Fernando Gaviria (UAE Team Emirates) took a debut win in his new colours, outsprinting Matteo Malucelli (Caja Rural-Seguros RGA) and Sam Bennett (Bora-Hansgrohe) to take the race lead. We don't know how big the time gap is from the leaders to the peloton yet. They're not in danger of being brought back anytime soon, though - the peloton has just passed through the latest sprint point some time after the break. Scheurs, Gohr and Bravo was the order over the second sprint of the day. Gaviria led over the first one, after just 3km of racing. Meanhile, with 95km to race, Argentine Luciano Montivero (Agrupacion Virgen De Fatima) has broken away from the peloton in pursuit of the leaders. 1:30 is the gap from the leaders to the lone chaser Montivero, who isn't too far off the head of the peloton by the look's of things. Unsurprisingly, UAE Team Emirates are leading the peloton. They're riding in service of race leader Fernando Gaviria. 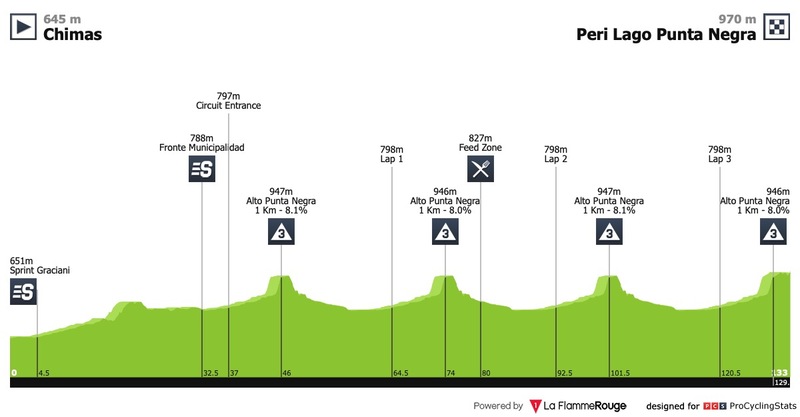 The Colombian will face a tough battle to hold onto that lead today though, with the Alto Punta Negra (1km at an 8 per cent average) coming just 3km from the finish. Last year he finished 31st, 8 seconds off the stage winner Roman Villalobos. The lead quartet are on the climb now. With 85km left to race, they'll tackle it twice more before the final ascent. Alvarez led Schreurs and Gohr over the top of the Alto Punta Negra. Bravo seems to have lost contact on the climb. The peloton knocked off the pace on the way up. They're 4:36 back now. Another rider is between the leaders and the lone chaser Montivero. He must've snuck away when the cameras weren't looking. Down into the valley now and some problems with the tv camera reception as the three leaders roll along. The situation remains much the same as we wait for the leaders to hit the climb again. Deceuninck-Quick Step are visible at the front of the peloton now too. They'll be riding for Julian Alaphilippe today. The camera focuses in on Daniel Diaz, winner of this race in 2013 and 2015. The Argentine spent two years in France racing for Delko-Marseille before returning to South America last season. 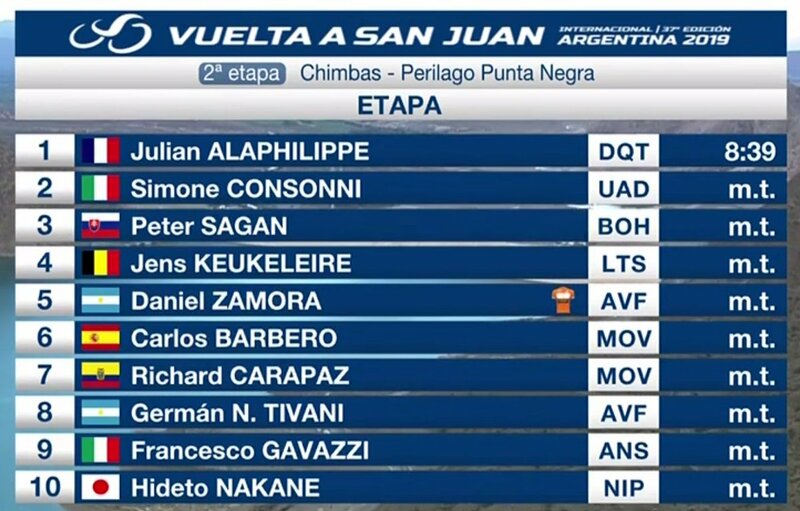 Now he's racing for Argentine team Equipo Continental Municipalidad de Pocito, which is the town we finished in yesterday. None of the chasers managed to make it up to our three leaders. They haven't been shown on television at all, so they're likely back in the peloton now. Alvarez led the way up the climb, with nobody challenging him for the points at the top. Gohr and Schreurs followed the Mexican over the line up the second ascent of the day. 59km left to race. The gap is around 3:15 as the peloton crests Alto Punta Negra. We're inside the final 50km now, and the gap to the leaders dips under the three-minute mark. Bora-Hansgrohe, Deceuninck-Quick Step and UAE Team Emirates remain at the head of the peloton. They're chipping away at the gap, which is almost down to two minutes. Inside 40km now, and the lead trio are still working well together. And we have our first sighting of Nairo Quintana who moves up front, just ahead of Fernando Gaviria. 35km to go and the gap is 1:25. Bernhard Eisel leads his Dimension Data team up on the left-hand side of the peloton. 30km to go and the leaders hit the climb for the penultimate time. Just Scheurs and Alvarez up front now, as Gohr drops back. Schreurs is descending a la Mohoric now. He's solo out front, just over a minute ahead of the peloton with 26km to race. Schreurs is still holding out pretty well. He's 50 seconds up on the peloton with 14km to race. There's still another climb to tackle though. And it's over for Schreurs. Movistar hit the front on the final ascent of the climb. And Julian Alaphilippe takes over as they hit the 3km to go mark! Nairo Quintana and Tiesj Benoot are with him. Alaphilippe got away in the final kilometre though. He's soloing to the line. Alaphilippe holds of the remains of the peloton to take the win! Consonni (UAE Team Emirates) and Sagan (Bora-Hansgrohe) rounded out the podium. Gaviria keeps the overall lead, but Alaphilippe closes to within 3 seconds on GC, while Consonni moves up to third. Tomorrow's 12km time trial around Pocito should see the standings shaken up even further, while a summit finish on Alto Colorado awaits the peloton on Thursday.